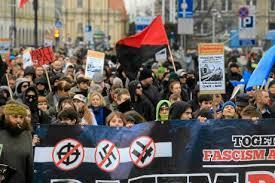 On November 11, 2013, two squats in the center of Warsaw were attacked by nationalists and fascists. The squatters resisted successfully. In their declaration the squatters’ collectives explain not only the connection between increasing right wing militancy and the state policies of exploitation and discrimination, they also make clear that a struggle against fascism has to be a struggle of the expoited against capitalism itself. demonstration’s private security, or “Independence Guard”, released the bonehead militia on us and then hid them among the demonstrators once they were done. All those who shout slogans or step in line with the ONR and MW are responsible for their violence. Despite the vicious assault, we effectively defended ourselves and our homes for half an hour. We did not give the attackers the satisfaction they were seeking. We resisted entirely by our own means, as we knew beforehand not to count on the authorities for support. We live here and we will stay here! “Be ready”- we often heard from our migrant friends, who live with us. They had already experienced nationalist violence when their homes were set on fire last year in the city of Białystok. Those attacks also took place while the police, prosecution and local authorities watched on. “Be ready”- we were often told by the tennants who hold a housing rights legal clinic every Tuesday in Syrena. They are a part of the Warsaw Tennants’ Association, which was co-founded by Jolanta Brzeska who was stalked, attacked and finally burned alive by a developper’s militia. She too, like us, lived a few hundred meters from the police station. “Be ready”- we were often reminded by the workers and grassroots union members of the IP (Worker’s Initiative): Alas, violence against wokers occurs with the authorities’ full consent! We were ready, because we knew that the fascists aim for us to disappear. But we were ready also because we, the exploited, the deported, the evicted, or as they say, the freaks, the faggots, the illegals, have been defending ourselves for a long time already. Why? The fascists attack the homeless, but it is the authorities that evict people onto the streets or send them off to live in plastic containers. The fascists hunt migrant families, but it is the authorities who marginalize them, make them illegal, construct closed detention centers and organize collective deportations. The fascists murder “niggers”, burn mosques and defame jewish cementaries, but it is the authorities who finance dropping bombs on Iraq and Afghanistan. In this system, the fascist militias only execute what the authorities initiate. Physical assaults on migrants, tennants, workers and squatters are a real part of the system that only hasn’t been written into law yet. The struggles of our everyday are aimed to change this oppressive system: we block evictions, join worker’s strikes, support migrants’ hunger strikes, protest the war, fight privatization and corporate drilling projects. We break barriers and instead, we plant gardens and build inclusive communities. When the media present these attacks as a “fight between the extremes”, they tout to the benefit of the opressors. Above all, they pull a fogg screen over the real extremes: the difference between the 99% of us who try to make ends meet to survive in this country and the authorities who relentlessly exploit us. We will not appeal to the authorities for anything; for better equipment or human rights courses for the police, for more cameras on the streets, to legalize one thing or to delegalize another. For the authorities to delegalize the nationalist demonstration is to let the oppressor’s logic take the upper hand. Instead of delegalizing face covering on the streets, the authorities should take off their own masks: let them answer unmasked, why they create poverty instead of preventing its causes. We direct this call to all people: Be ready, because our homes are neither the first, nor will they be the last: They will come for you too! History forbids us to be passive, don’t let fear overtake you, don’t wait until it’s too late, GO OUT ONTO THE STREET, LET YOUR ANGER BE HEARD! Posted on November 15, 2013, in Europe and tagged Antifascism, Poland, Squatting. Bookmark the permalink. Leave a comment.